These are testimonials and comments from clients that I have been very blessed in having the privilege to connect with from 2012 to present. 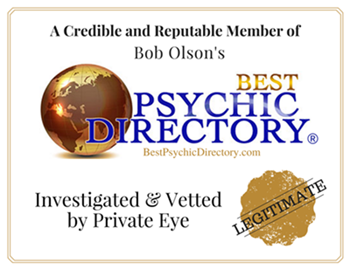 ​the Best Psychic Directory Link provided below. After seeing many not so good and bad psychics I was lucky to stumble upon Katherine in October of 2018 she has a true gift! She was direct, spot on, accurate and knew things about me that no one in this world could know. I am intrigued, surprised a little scared and always in awe of her Accuracy, compassion and humour as well as ethics. Upon my third session this March 2019 She brought comfort and did predict by giving warning of health concerns that lead to the passing of a dear friend, even though, she will not answer questions predicting negativity or loss, she does tell what she sees and feels as warning, always states she only tells what comes through even if it makes no sense, she will not give her opinions. This pretty lady is the only one I will see and recommend. Katherine you are a true gift! I had an insightful, and delightful 60 minute reading with Katherien. She picked up on something right away, and I did not have to say anything. She told me things relevant, and very correct in my life. It was such a nice way she has about her. and I felt so at ease listening and speaking with her. All of the reviews are correct. She is amazing, and so accurate. I am so happy I found her. I have had several sessions you over that 2017 and 2018 and wanted to thank you for your honesty and integrity as well as opening the door to healing and hope for myself and my family through our difficult time. You are a true gift and inspiration and have an amazing gift. I am in awe and thanks for your being. I had a session with you in July of 2017 and wanted to state that although I was hesitant, You are an amazing lady! You have truly touched my soul and everyone I have sent to you. You are a true gift and I encourage all to see you. Thank you, for your gift. I had a reading with you in September 2016 and to be honest some of the things said felt they weren't for me. However 10 months later (present) I have to admit you were quite accurate and you hit all nails on the head. I wanted to thank you and give you my personal feedback. I wanted to say that I've had countless readings from you since 2012. I will admit there had been truths you told me that I didn't want to hear since I was living in denial! There had been events you told me that would come and pass that were up to 3-4 years into the future! At the time I didn't believe them since they seemed so far fetched. lol I am here to tell you that they had happened and are currently happening. I want to book a session with you again soon since I know you're funny, direct and always on point. The meditation you did with me was over 2 years ago. It was when I was going through an extremely difficult time, trying to cope with the loss of my grandfather. He was my fatherly figure and I felt so lost, and so, I turned to you. Today, my friend sent me an article about people getting conned by "fake psychics" and the likes. I told him that I generally do believe that there are a lot of crooked people out there but that you are genuinely gifted. There have been a couple of instances over the last couple years where I have pulled up your emails to me, and while not everything you said at the time made sense, it wound up being an (accurate) prediction of the future, rather than a current event. So while I may not have known at the time what you meant, it has since fallen into place. Your meditation predicted that my father in law was gravely ill. You also saw a recliner. He wound up passing away, in his recliner, only 7 months later. While your comments didn't make sense at the time (certainly the bit about the recliner), the shock I felt when went back and read that was astounding. Today, after speaking to my friend, I decided to reread your emails to me. In your meditation, you stated that I have TWO sisters. I assumed at the time that you meant that I have a sister and a sister in law. But I recently found out that I do in fact have another sister who was given up for adoption by my father, who has never been in my life. You truly have a gift. Even two years later, the parts of your meditation that didn't seem to make sense at the time are still falling into place. I have had several readings with Kathrien, and she is the best of the best. She knows everything that is happening around me and to me, and loved ones come through with crystal clarity. It's like have a telephone conversation; that's how close and individualistic they all feel. Such great advice and accuracy! And like a pro ballerina, or concert pianist, or great athlete, she makes it all look effortless, when it is definitely not. I am so glad I found her, and I highly recommend her! Just wanted to say thank you again for the reading last week. I've been listening to it often and it has provided me a lot of comfort. I look forward to my next reading with you. Thank you for my reading and being so gentle but so honest and fun and loving very personable ! You have an amazing gift ! After seeing several characters and fakes spouting vague stories I was so pleasantly surprised to meet you, you are the real deal and I find myself still mesmerized at the fact that you knew so many things about me, specific things as well as everything you stated came true. Thank you Katherine I will be back and I will and have recommended you to all. I have had two readings from this wonderful lady as well as recommended her to others in my life. My first overall impression of her was that she came across and kind and accepting. Even though this was over the phone she knew and said things only I would know. She was accurate , explained things , and truly made you feel like a different person at the end of the session. She is worthy every penny. And I will continue to have many more readings with her in the future. I just wanted to say a big Thank You! My parents thoroughly enjoyed the reading with you and said that you were spot on. Thank you, for taking the time to book me in so fast. You are incredible, I must admit I did not believe in psychics until I stumbled upon you. Thank you so much Katherine.Your reading was a gift and I am grateful. Katherien I will continue to send people your way, you have been an angel. I thank you, for your gift. You are truly a gifted women, I cannot wait to come back and see you again. Your meditations are a gift. There are no words to express how fortunate I am to have been able to connect with you. I need time to process everything and will connect again with you in the future when I am in a different frame of mind. Thank you again for everything. You are a true gift. Thank you for the amazing session today. I was very astonished and surprised at the detail and accuracy of your session. You were well worth the wait and the drive. I will recommend you to everyone! You're gift is true! Thank you so much for your psychic meditation. I am still totally amazed by your accuracy. You have given me much comfort and a sense of peace. I have always been skeptical with certain people and you are truly the real deal. Bless you and I wish I could give you a big hug. I will be working with you again, and I will recommend you without a shadow of a doubt. You are amazing ! Good afternoon Katherien, I just had session with you and must state I have been to a few other well known high priced psychic mediums which whom have left me questioning as well as doubtful. You are the real deal. Amazing! I am reveling in wonderment the details you knew about me. After seeing many psychics from tarot readers to mediums I will state you are the true gift. I was very amazed and intrigued by your boldness, accuracy and compassion during my session. I will be back and will recommend you to all. Thank you for the reading. you have an amazing gift. Thank you so much for my session with you yesterday. It cleared questions and worries I had...I only wish I had taped our conversation, so I could go back to things you mentioned. I just gave your email and website to my daughter, as a friend of hers would like to get in touch with you. My reading with Katherien left me impressed. I had a couple other readings with others which did not come close to accuracy of information, useful information, validating information. The things you said, could not have been known or random.. They were specific. I've re-read my notes and am reminded how many detailed things you spoke about that just blew me away. You insisted I wait awhile to redo another reading showing that you were not just after my money. I am really looking forward to our next reading! Thank you so much! Just wanted to say "thanks" for your wonderful view into my present, past and future. It was definately needed at this time in my life and you have given me hope and anticipation for the future. What I liked most is that you were very specific about people and events. You have a great gift and thanks for sharing it!!! "I went to see Katherien with my sister in hopes of connecting with family that have passed, she is the best in the business, we have seen many other psychic mediums prior but none that were accurate. I recommend her to all seeking truth and validation that our loved ones are indeed around." "She is amazing and we will be back!" "I find Katherien to be a very easy lady to talk with and to open up to. I am very comfortable with her, and have learned lots about myself and gained comfort level with the things to come in my life. I recommend her to all my friends and many people from my family have seen her, and will be back. Thanks Katherien, I hope to see you soon." "I've had 3 readings in total from Katherien, the first was very overwhelming, emotional, shocking feeling. There was never "obvious points or statements" that "anyone" could related to. Its the real, detailed points that pushed me further for another reading. And with that special reading, I wanted to push further for a personal reading. It's an experience that I will remember forever, I relive at least once a day, and it has made me more comfortable with myself. Katherien has done a phenomenal job with connecting to spirit. I'm so happy I did this, and I can't wait for another! :) Thank you Katherien, once again! What you do and what you we're able to relay has really made a difference in my life for the better." our basement). What I loved about my experience was the way she was accurate with such detail that there was no way I could doubt her authenticity." "I attended a one hour session with you this year, at a time, I was seeking clarity in my life in the various roles I play - mother, wife, and in my career and relationships. in our lives. It was an amazing experience that I will look forward to again. You have an amazing gift and I am thankful for your openness to share it. " photographs. She described their character traits and expressed certain things that only I would know. "I have had a reading with Katherien. She is an amazing healer and psychic medium. am very thankful to have come across Katherien. I 'm forever very grateful for her advice. I wish her all the best." Thank you Katherien so much for my reading. I was completely happy with all you told me. I can't tell you enough how much you've helped me get through my personal issues with my parents/family. Your encouragement & insight has helped me be at peace with my life. Which is what I've been searching for & wanting for so long. You're truly an amazing person. Thank you again for being so honest. Katherien, I wanted to forward to you a quick thank-you! Our discussions have been within the purest form: direct, straight to the point, honest & accurate. You have a sense of giving me peace in mind :) Thank-you for your intense capability of intuition and guidance. Thank you Katherien. Much of what you have shared has given me more peace and comfort. Some is still a bit puzzling, but perhaps as the time passes it will become more clear. Other things seem to be my sister's words for sure, as only she and I would know/share. Thank you again. You may hear from me again. When I needed to connect with my daughter,Katherine's reading was uncanny. I couldn't believe the things that she got from my daugher who was only two days old. Katherien's special gift has brought me and my family alot or answers and peace of mind she helped at no charge out of the kindness of her heart because it's a missing persons case and we where really lucky to have her working on my mothers case. She is amazing at what she does and knows what she's doing I couldn't of came to terms with alot of things if it was not for her time and her special gift! The readings where accurate and very helpful. I would like to share with others my thoughts concerning the readings I have had with Katherien. I had lost my loving husband over a year ago. I really needed to reach out to someone in order to connect with him. Katherien's readings have always been amazingly accurate. There were things in my life that my husband and I shared that no one could possibly have known as well as my personal life, but Katherien picked up on them right away. My husband came through exactly the way he would have in life here with me. His messages to me were beyond words. My readings have brought me so much peace and I can't thank Katherien enough. It 's so wonderful to have someone to reach out to. Grief can be so devastating and not everyone has the patience to listen.Katherien told me about my dog, that she had a problem with her stomach. I had just taken her not long before my reading to the vets and I had no idea she wasn't well. I took her back right away and she was very ill, she was kept at the Vets for a week. She's doing well now and I am so thankful that I didn't lose her. I will continue to have readings with Katherien. Being spiritual myself, it's nice to have someone to connect with and who truly believes that we continue on after this life and will be with our loved ones again. Thank you Katherien for your compassion and for sharing your amazing gift. I want to truly thank you for the wonderful reading!! This was the first medium reading I've ever had and I thoroughly enjoyed it! I received the closure I was hoping for. I will definitely recommend you to my friends. Take care and thanks again! !